This newborn baby boy is admitted to the intensive care unit of the hospital. He is extremely premature and does not weigh enough to manage on his own. He has undergone two surgeries and needs another one month stay in the hospital. His mother, Sujata, has been near his side whenever she is allowed to. 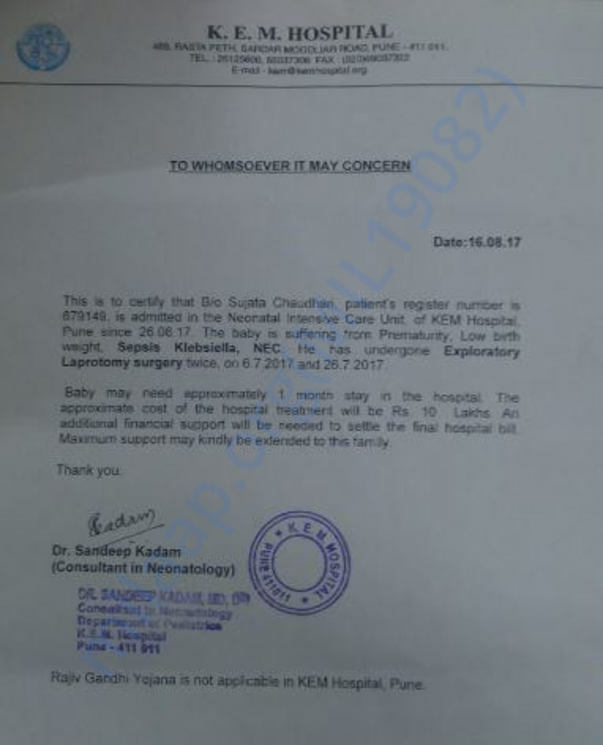 Unfortunately, baby boy Chaudari has required two Exploratory Laparotomy surgeries in the little time he has been in this world. His intestines are not absorbing nutrients due to which he is not gaining weight. The doctors are trying their best to help him survive. "He is our life now, not bigger than our hand. Watching him in pain is just unimaginable. Yet, there is nothing much I can do except trust his doctors to get him better. God has given him to us. I expect God to show us a way to take him home." Adinath has managed to save around Rs. 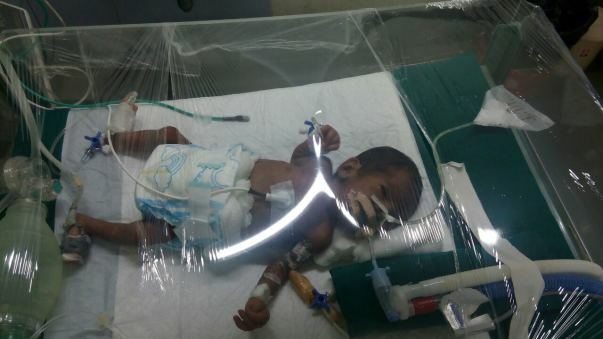 1.5 Lakhs for this baby, but the expenses for his recovery shoot well beyond Rs. 10 Lakhs. His elderly parents depend on him, and there is nobody else to help him come up with these funds. Your support will help this couple keep their 20-year-old dream alive. This dream is a premature born baby boy fighting to survive. 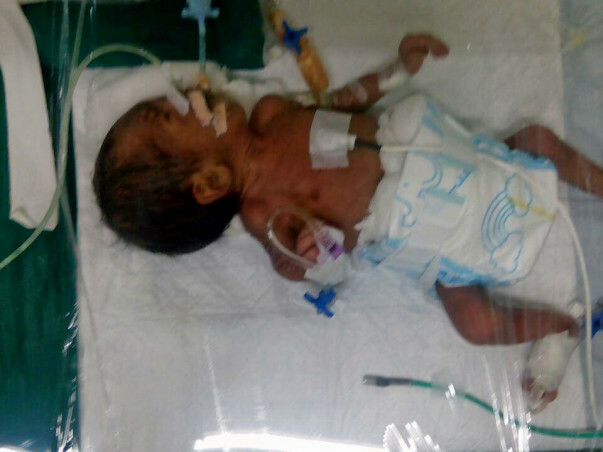 We got news from the parents that the baby boy of Sujata passed away on the way to their home. The funds raised so far have been utilised to close the pending bills of Rs. 7.14 lakhs. We pray the family finds strength in this time of grief. Thanks for offering your support to help the babies get the best care they needed. I am very grateful to all the supporters for your help for the baby. Unfortunately, his wounds are not getting healed. He is not gaining weight. The parents have decided to discontinue the treatment and take him home. Kindly share the campaign among your network and help this baby. Requesting you all to continue praying for him. 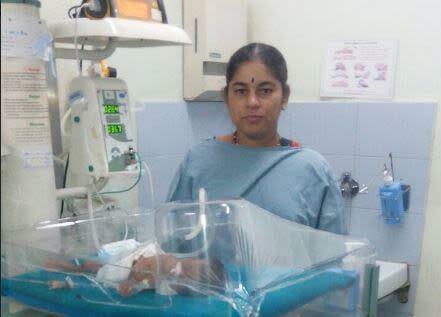 I am pleased to inform you that, the baby of Sujata Chaudhari is doing well. In spite of two intestinal surgeries, he is tolerating feeds. He does not require any respiratory support. He is on the path of recovery. However, he has lost weight. Let us pray for him to gain adequate weight and recover from the wounds due to surgeries. Thank you all for your support and blessings. God Almighty bless you all!